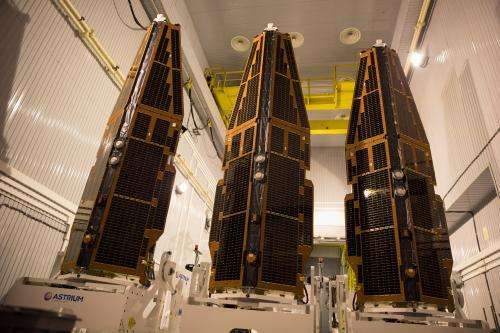 The launch of ESA's magnetic field mission from Plesetsk, Russia, has been postponed by about a week. The announcement from the mission's launch service provider, Eurockot, follows the decision to replace a unit in the Breeze upper stage of the Rockot launcher. Originally scheduled for 14 November, the launch is expected to be delayed by about one week. More details will be given as they become available. The three-satellite Swarm mission aims to unravel one of the most mysterious aspects of our planet: the magnetic field. The field protects our planet from cosmic radiation and charged particles that bombard Earth in 'solar winds'. Without this protective shield, the atmosphere as we know it would not exist, rendering life on Earth virtually impossible. By analysing the different characteristics of the field, the mission will provide new insight into many natural processes, from those occurring deep inside the planet to weather in space caused by solar activity. In turn, this information will yield a better understanding of why the magnetic field is weakening.